CCTV, GPS, GIS Project slide presentation, courtesy Cues, Inc.
Gyroscopes - low risk, no footprint, no surface impact, good accuracy reported, requires access to existing utilities for insertion, pipes only, not always able to transverse offset joints or roots, needs in office compilation. Electric, communications, gas, water, etc. 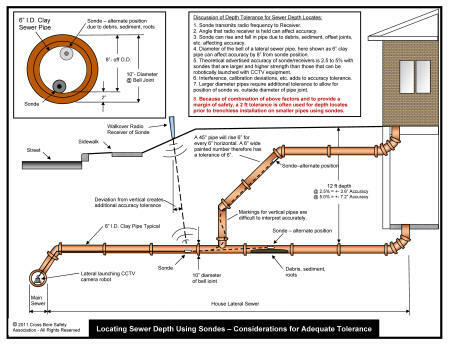 Note: Intersections of can be into both sewers and backfill of trenches, annular space around utility or pipe bedding allowing for unobserved transmission to structures and to other utility's or their backfill or annular space and connected structures. 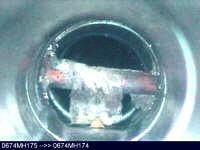 Can be integrated to internet accessible for sewer service contractors to determine if an address has been determined to be cross bore free of gas lines in sewers.